Predominantly, and subjectively, the Halloween franchise has more duds than successes. Following the restrained, moody eeriness of Halloween, the series slipped into sequels that often conformed to genre conventions. Given the original created a handful of these conventions, underwhelming is the best way to describe Halloween 4 and Halloween 5. Halloween: Resurrection is just downright silly. Halloween: H20, which marked the 20th anniversary of the franchise, was a more hopeful entry, especially in terms of box office. Then Rob Zombie stepped in to re-jigger the franchise. Retelling the story while adding more backstory and implanting his signature grisly style, the 2007 Halloween reboot was divisive. It and its 2009 sequel has its fans, and Zombie can be commended for bringing an original take to a tired franchise. The films are nothing if not different than a Carpenter film. Halloween (2018), directed by David Gordon Green and co-written by Danny McBride and his collaborator Jeff Fradley, stands in stark contrast to Zombie’s vision. This new entry, which takes only the first film as its canon and names Carpenter as a producer, is a clear homage to Carpenter’s style. Taking place in Haddonfield 40 years after the events of Halloween, the film follows three generations of Strode women. Laurie Strode (Jamie Lee Curtis) has spent her years following the traumatic events of Halloween night 1978 preparing for Michael Myers’ return. Fortifying a home in the woods, she is stockpiling for the fateful night where she will have to face off against The Shape again. She prays for his escape from high-security mental health facilities, just so she can finish the nightmare once and for all. Somewhere along the way, she had a daughter. But she lost Karen Strode (Judy Greer) to child protective services because of her safety precautions and preparations. Now, Karen is mother to high schooler Allyson (Andi Matichak), who wants her grandmother to be a larger part of her life. Of course, because Halloween is approaching, Michael Myers is in the process of being transported to a new hospital when…he escapes. What ensues from here is a face off between Michael and Laurie, with many diversions along the way in which tertiary characters become fodder for the blind march of death that is The Shape. In many of these cases, the staging and nature of the deaths whimsically champion the bloodlust of the masked killer. While this unabashedly implicates us with the killer, the craft by which Green uses deliberate pans and tracks (in long takes) to capture the deaths makes for fun set pieces. This deliberate camera work, alongside the John Carpenter score, creates a similar mood to the original Halloween, which itself works perfectly as a mood piece. Even when the plot indulges in tangents, some of which pay direct homage to scenes from the original film in a way that feels redundant, the craft of the sequences is hard to deny. A perfect example of this comes in a shot introduced in the trailer. On Halloween night, two kids bump against a domineering Michael Myers, who pivots away from them and begins his onslaught on the town of Haddonfield by entering houses and picking up weapons on the way. The woman he takes a hammer to in the trailer is of no importance to the plot (even characters who have speaking lines are largely of no importance, unless their last name is Strode). But at least the shot composition is nice to look at. Green writes a love letter to Carpenter with this homage-heavy sequel. This tips to the nauseating end of nostalgia in some instances, but largely the balance of old and new is achieved. That said, the new comprises some unwelcome additions. For example, a stand-in for Dr. Sam Loomis, Dr. Sartain (Haluk Bilginer), is a silly, silly, silly character. When his character becomes important for the plot to continue, he acts just…so silly. Then there are the two podcast journalists, who (hilariously) have $3,000 to burn paying one interview subject. No podcasters have that much money to throw into what would be a couple minutes of audio. Given the film starts on them, their relevance to the plot is also rather hilarious. How the male podcaster screams at Michael Myers in the first scene: hilarious. (Green’s version of Haddonfield is obsessed with getting Michael Myers to speak, which I don’t recall being such an important point in previous films). These added characters wouldn’t be such a bother if they didn’t steal screentime from Jamie Lee Curtis. For a large portion of the film’s second and third acts, Curtis’ Strode is absent. Given how the film climaxes, the time spent away from the Strode family during Michael’s killing spree comes off as impertinent filler. The resolution would hold much more weight if the script kept centered on Laurie, as opposed to switching to Michael’s perspective for an entire act of the film. 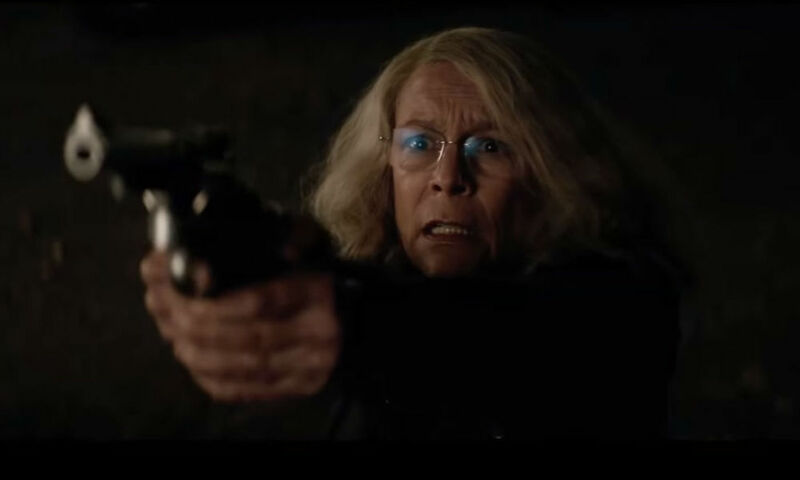 Halloween (2018) is the polar opposite of Rob Zombie’s take on the IP. Those who enjoyed Zombie’s original take may balk at David Gordon Green’s reverent emulation of Carpenter’s style. Those not feeling the need to take horror sequels too seriously, opting to instead take them as they are, may find heaps of enjoyment in the merciless, unceasing force that is Michael Myers in Haddonfield. Personally, I fall somewhere in the middle. All the same, this is a film true to its title: Halloween is a great Halloween film. It feels like the heart of fall, when pumpkins glow and shadows make one take pause. At its best, the eerie mood pulls you in and makes you believe that it is October 31st, and that suburban streets are filled with costumed children who are blind to the dangers of knife-wielding shapes in the night. This is an excellent review that contains some interesting and salient points about the franchise and some of the new movie’s goofier plot points.